(1940/41 'OKeh') (68:21/25) Diese umfangreich illustrierte Ausgabe bringt viele unveröffentlichte und alternative Fassungen / this lavishly illustrated edition contains many previously unissued tunes, and alternate takes. 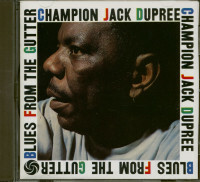 Ever since he first surfaced on OKeh in 1940 (his '41 platter Junker Blues was the direct precedent for Fats Domino's The Fat Man nearly a decade later), New Orleans native Champion Jack Dupree had been attacking the ivories with a ferocity that anticipated rock 'n' roll. 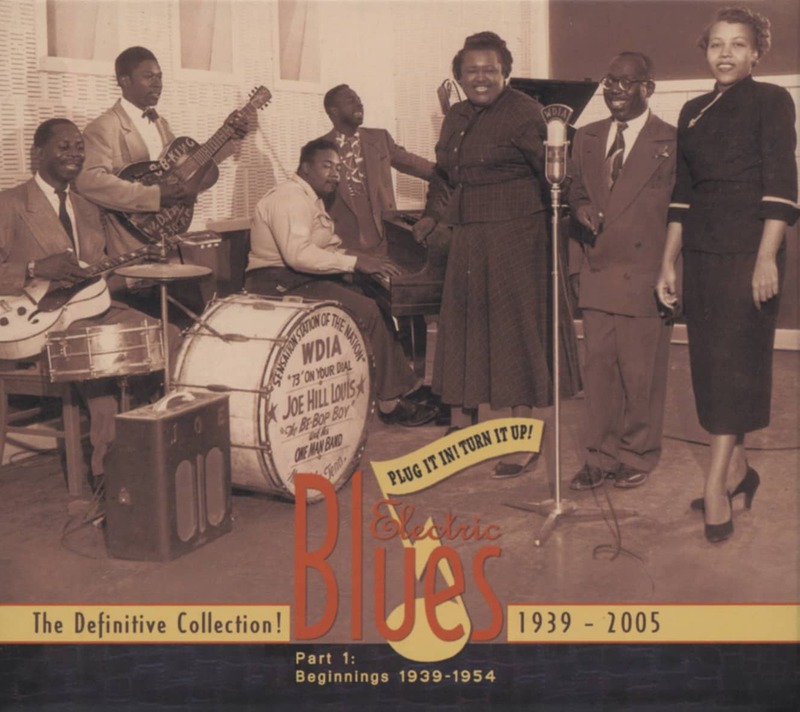 On 1953's Shim Sham Shimmy, cut for Bobby and Danny Robinson's New York-based Red Robin imprint, his thundering boogie was abetted by Brownie McGhee's crashing, distorted lead guitar (Brownie's brother Stick was also on board, along with bassist Bob Harris and drummer Willie Jones). Dupree was introducing a new dance that had been around forever, yelling lyrics with barrelhouse-tested glee. 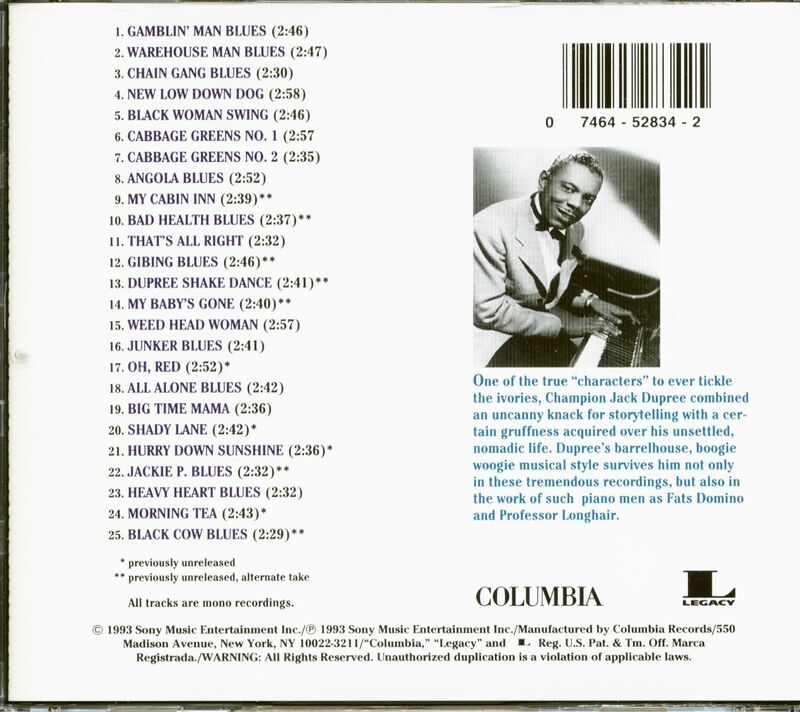 Born William Thomas Dupree on July 4, 1910 (or one of several other dates he cited over the years), he spent a lot of his childhood in the New Orleans Home for Colored Waifs (an establishment Louis Armstrong also knew well). He learned to play piano in part from watching local 88s aces Drive 'Em Down and Tuts Washington. 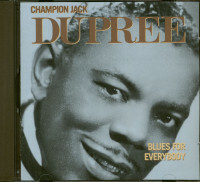 Dupree headed north in the early '30s, earning his 'Champion Jack' moniker as a prizefighter. He commenced recording in Chicago for the ubiquitous Lester Melrose on OKeh, then served as a cook in the Navy during World War II (he was a Japanese POW for two years). 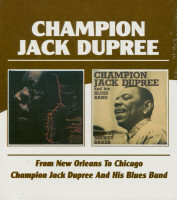 Back stateside after the war, Dupree settled into the postwar New York scene and was much in demand as a recording entity, judging from the volume of his postwar discography (labels included Joe Davis, Continental, Lenox, Alert, Apollo, Abbey, Apex, Gotham, Derby, King, and Harlem). Thanks to McGhee's blazing electric axe, Jack's three Red Robin singles hit as hard as anything he did during this nomadic period. 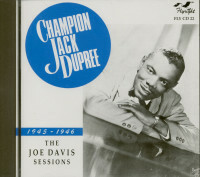 Dupree settled into a stable relationship with King Records later in '53, then RCA's Groove and Vik subsidiaries in 1956-57. The piano man made a seminal LP for Atlantic in '58, 'Blues From The Gutter,' then bid the U.S. adieu for the welcoming shores of Europe, where he thrived for the next three decades. Dupree finally returned to New Orleans to perform at the 1990 'Jazz & Heritage Festival' and make a CD for Bullseye Blues. He was diagnosed with cancer the next year and died in his adopted hometown of Hannover, Germany on January 21, 1992. 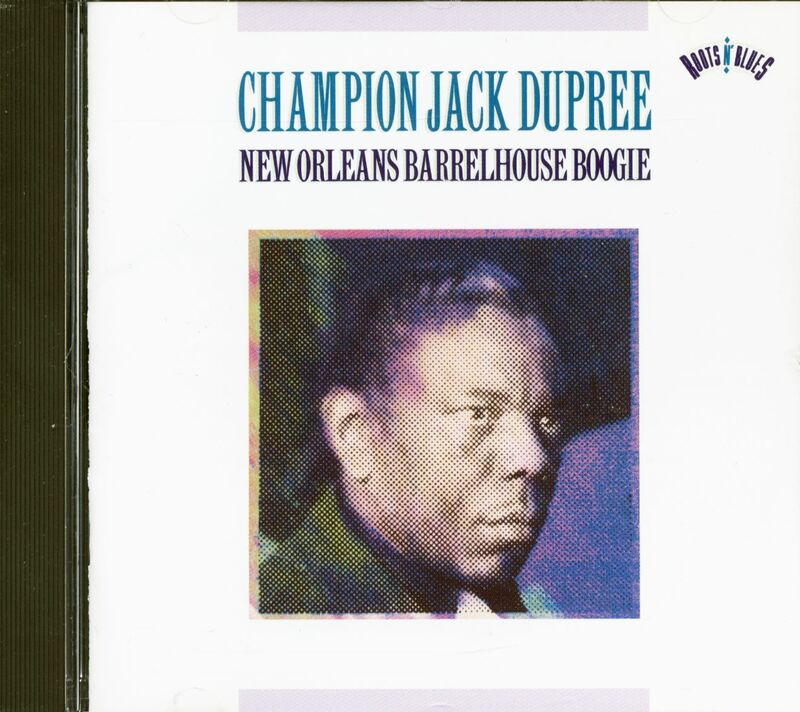 Customer evaluation for "New Orleans Barrelhouse Boogie (CD)"